RIP 03-01-2014 - we will miss him! Frosty has been at the ranch since 1995. He was used for ranch work and trail rides for cowboys and guests alike. With his mellow and laid back disposition he was the first pick for the more inexperienced riders, yet he had the speed to run a cow down when pasture roping with a ranch hand. 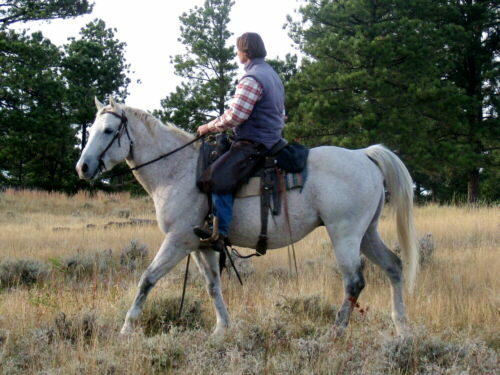 He was pastured and corralled with the ranch remuda, geldings and mares, without any problems. Frosty passes his size (16 hands) and stout conformation on to his foals, as well as strong legs and exceptional hard feet. His friendly and calm disposition gives his offspring their pleasant and very easy trainable personality. 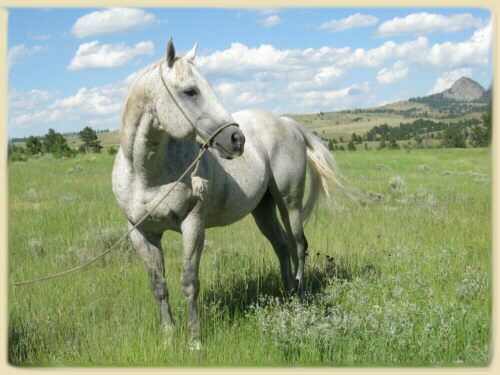 Frosty's sire Frosty Feature made his name as winner of race and halter points (AQHA H-91/P- Superior Halter SI-81, AA ROM Race), however, his offspring also excels in Roping and Steer Wrestling. A Black Feature owned by Charmayne James is a half brother of Dorky Frosty Spark. 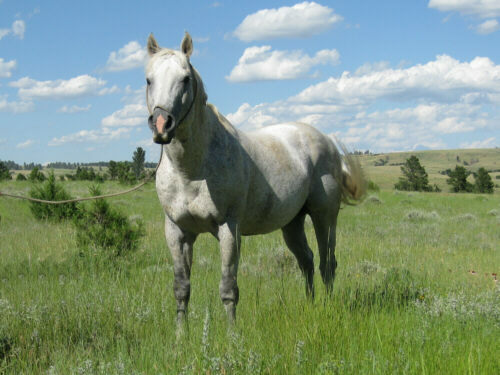 His dam adds AQHA Hall of Fame'rs Doc Bar and Two Eyed Jack to his pedigree, as well as some more speed in her bottom breeding (Tonto Bar Ted: SI-100). This picture was taken in October 2011. 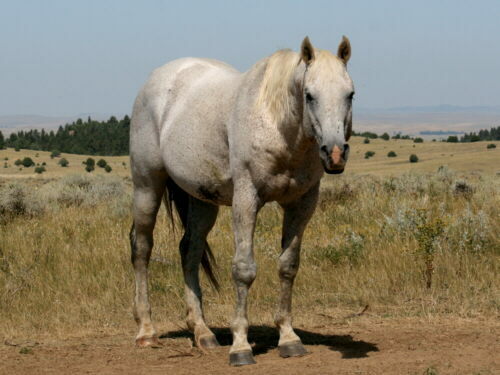 Frosty had spent the last 9 years out on pasture with his mares and not been ridden. 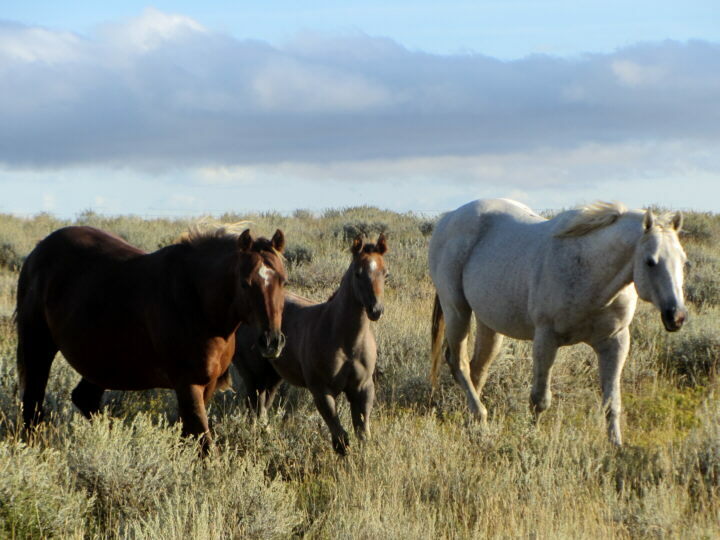 This day we planned to bring the broodmares back to the ranch. 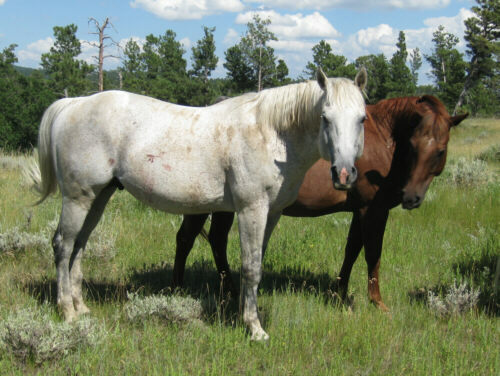 Rancher Ferdi rode out on a saddle horse, when we arrived in Frosty's pasture he unsaddled his horse, walked up to Frosty, put the bridle on, threw the saddle on, stepped into the stirrup and rode off chasing Frosty's mares 3 miles back to the ranch. 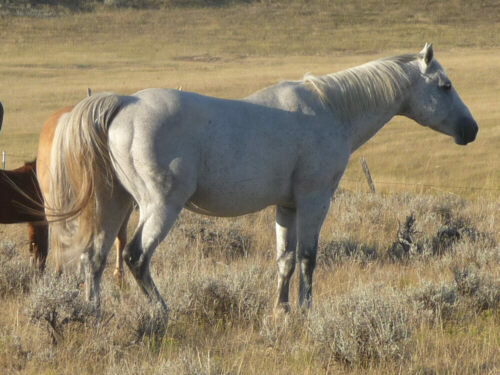 There was no groundwork, he just got on, the country is rough, the mares weren't very cooperative, and there is this stallion who just works along without a hint of a buck but gets to business after a 9-year vacation. I do not recommend to anybody to saddle up a fresh horse like this without any groundwork, but it sure was impressive!